How Long is a Personal Injury Lawsuit Timeline and What is the Cost to File? Home › Personal Injury › How Long is a Personal Injury Lawsuit Timeline and What is the Cost to File? Accidents can happen in the blink of an eye. You’re standing on your own two feet or driving your car and then suddenly you’re not. Unfortunately, a personal injury lawsuit timeline does not move as fast. There are several factors for both sides of a personal injury lawsuit to consider as they move forward. Some settlements can be reached within a month. If the case must go to trial, the personal injury lawsuit timeline can be much longer. Each case’s timeline is different, so this article is going to present a close approximation of the steps in filing a personal injury lawsuit, how long each one takes, and how much the entire process might cost. It is imperative for your personal injury lawsuit that you seek out medical attention for your injuries immediately following the accident. It doesn’t matter whether it was a dog bite, slip and fall, car accident, or falling object; you need to seek medical attention. The doctor will not only work towards healing you, but they will comprehensively document your injuries as a result of the accident. 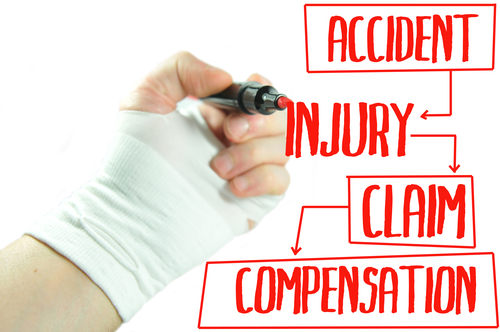 Once you are able, you should also contact a personal injury lawyer and set up a consultation. If your case is taken by the lawyer, they will begin their investigation of the events. After the investigation and review of accident reports take place, the next step in the timeline of a personal injury lawsuit is to enter into negotiations with the liable party and submit a demand letter. This process can take weeks and, in some cases, it can take months. Your lawyer won’t enter this stage until you have reached maximum medical improvement. Once your medical bills have been tallied at the end of your recovery period, your lawyer will know how much money to ask for in the demand letter. Your lawyer will then enter the first round of negotiations. A settlement might be reached during this time and the case could come to a close. If a settlement can’t be reached, your personal injury lawyer will file a lawsuit with a local or state court. Two years is the typical deadline to file a lawsuit in a car accident or slip and fall case. At which point, they will enter the discovery period of your lawsuit. In this stage, each side will review the evidence that has been compiled by the other. Each lawyer is allowed to ask follow-up questions of the other and conduct their own investigations about the other’s evidence. Additionally, each side can depose the other party and their witnesses under oath. This process can take anywhere from six months to one year, depending on the number of variables that need to be reviewed. Typically, the second round of negotiations will take place at the end of this period. If an agreement can still not be reached, the case will proceed to trial. The actual trial could happen in a couple of days or take a few weeks. Each side will have the opportunity to present their evidence. A jury will then decide liability and award damages if there is liability. An arbitrator can do this as well if you elect for arbitration in lieu of a jury. A jury’s ruling is binding, even if they don’t side with the injured person. You can enter into an appeal process, but this can add several more years to your case and can be very expensive. Most personal injury lawyers will not require any upfront fees during the entire personal injury lawsuit timeline. However, they will charge a contingency fee if they win your case. This number is usually 33% to 40% depending on the case. Some big law firms will cover all the legal costs up front and you will pay them back at the time of the settlement or award. However, there are many personal injury lawyers who will not do this and require you to pay the fees up front. These fees can include filing fees, expert witness fees, investigator fees, depositions, trial exhibits, postage, police reports, and medical records. If you don’t pay for these fees, your case could stall, as the lawyer can’t move forward without this information. You should begin making payments on your medical bills during this process. Having your bills enter collections could have you paying more than the original amount. You will be reimbursed for all these expenses as they are taken into consideration in a settlement or an award for damages. Navigating a personal injury timeline is a stressful and complicated process. You need to recover from your injuries. Let an experienced personal injury lawyer handle every step of your case. Jesse Kalter has recovered monetary damages for a broad range of accidents. His unrelenting pursuit of justice has gotten his clients the settlement they deserve, time and time again. Jesse Kalter is available to serve the people of Reno, Sparks, Carson City, Fallon, Fernley, Dayton, Yerington, Douglas County, and all other Northern NV rural counties.